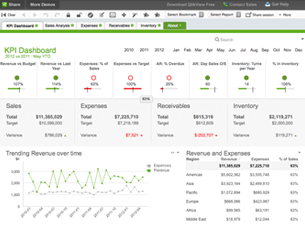 With QlikView you are able to draw conclusions from your operating figures much faster and easier than before. 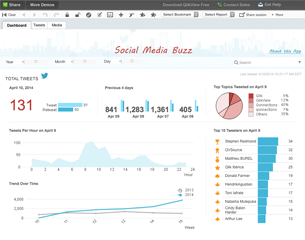 Data from different sources are displayed and processed automatically in clearly arranged charts. Own data, i.e. Excel-Files can be inserted without EDP knowledge. The innovative solutions of QlikView are cost efficient, user friendly and time saving. You can answer new questions with a click. That saves human resources, provides exact information and allows fast decisions. Assumptions and subjective interpretations are a thing of the past. In the evening of a workday you can check with a click on a button how business went - and overall: why did it go like it went. Provide one set of data and apps for use across your entire organization. KliqCalc - allows using of an Excel-like Worksheet in QlikView with more than 300 functions from Excel! Also the compilation of the profit and loss is possible without much effort! KliqMap for Esri is a smarte way to connect your business data in QlikView with geodata of Esri. Enquire now and arrange a personal consultantcy appointment with our export free of charge. We're looking forward to hearing from you!